The local geometry of the universe is determined by whether the relative density Ω is less than, equal to or greater than 1. From top to bottom: a spherical universe with greater than critical density (Ω>1, k>0); a hyperbolic, underdense universe (Ω<1, k<0); and a flat universe with exactly the critical density (Ω=1, k=0). The spacetime of the universe is, unlike the diagrams, four-dimensional. The flatness problem (also known as the oldness problem) is a cosmological fine-tuning problem within the Big Bang model of the universe. Such problems arise from the observation that some of the initial conditions of the universe appear to be fine-tuned to very 'special' values, and that small deviations from these values would have extreme effects on the appearance of the universe at the current time. In the case of the flatness problem, the parameter which appears fine-tuned is the density of matter and energy in the universe. This value affects the curvature of space-time, with a very specific critical value being required for a flat universe. The current density of the universe is observed to be very close to this critical value. Since the total density departs rapidly from the critical value over cosmic time, the early universe must have had a density even closer to the critical density, departing from it by one part in 1062 or less. This leads cosmologists to question how the initial density came to be so closely fine-tuned to this 'special' value. The problem was first mentioned by Robert Dicke in 1969.:62,:61 The most commonly accepted solution among cosmologists is cosmic inflation, the idea that the universe went through a brief period of extremely rapid expansion in the first fraction of a second after the Big Bang; along with the monopole problem and the horizon problem, the flatness problem is one of the three primary motivations for inflationary theory. According to Einstein's field equations of general relativity, the structure of spacetime is affected by the presence of matter and energy. On small scales space appears flat – as does the surface of the Earth if one looks at a small area. On large scales however, space is bent by the gravitational effect of matter. Since relativity indicates that matter and energy are equivalent, this effect is also produced by the presence of energy (such as light and other electromagnetic radiation) in addition to matter. The amount of bending (or curvature) of the universe depends on the density of matter/energy present. are Newton's gravitational constant and the speed of light, respectively. , and hence a closed universe. Ω < 1 gives a low density open universe, and Ω equal to exactly 1 gives a flat universe. The right hand side of the last expression above contains constants only and therefore the left hand side must remain constant throughout the evolution of the universe. must have increased by a similar amount to retain the constant value of their product. The relative density Ω against cosmic time t (neither axis to scale). Each curve represents a possible universe: note that Ω diverges rapidly from 1. The blue curve is a universe similar to our own, which at the present time (right of the graph) has a small |Ω − 1| and therefore must have begun with Ω very close to 1 indeed. The red curve is a hypothetical different universe in which the initial value of Ω differed slightly too much from 1: by the present day it has diverged extremely and would not be able to support galaxies, stars or planets. , is defined as the density for which the curvature k = 0). 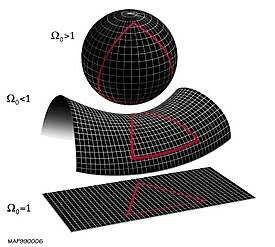 The curvature can be inferred from a number of observations. One such observation is that of anisotropies (that is, variations with direction - see below) in the Cosmic Microwave Background (CMB) radiation. The CMB is electromagnetic radiation which fills the universe, left over from an early stage in its history when it was filled with photons and a hot, dense plasma. This plasma cooled as the universe expanded, and when it cooled enough to form stable atoms it no longer absorbed the photons. The photons present at that stage have been propagating ever since, growing fainter and less energetic as they spread through the ever-expanding universe. Another probe of Ω0 is the frequency of Type-Ia supernovae at different distances from Earth. These supernovae, the explosions of degenerate white dwarf stars, are a type of standard candle; this means that the processes governing their intrinsic brightness are well understood so that a measure of apparent brightness when seen from Earth can be used to derive accurate distance measures for them (the apparent brightness decreasing in proportion to the square of the distance - see luminosity distance). Comparing this distance to the redshift of the supernovae gives a measure of the rate at which the universe has been expanding at different points in history. Since the expansion rate evolves differently over time in cosmologies with different total densities, Ω0 can be inferred from the supernovae data. Data from the Wilkinson Microwave Anisotropy Probe (measuring CMB anisotropies) combined with that from the Sloan Digital Sky Survey and observations of type-Ia supernovae constrain Ω0 to be 1 within 1%. In other words, the term |Ω − 1| is currently less than 0.01, and therefore must have been less than 10−62 at the Planck era.
) it would expand so quickly and become so sparse it would soon seem essentially empty, and gravity would not be strong enough by comparison to cause matter to collapse and form galaxies. In either case the universe would contain no complex structures such as galaxies, stars, planets and any form of life. This problem with the Big Bang model was first pointed out by Robert Dicke in 1969, and it motivated a search for some reason the density should take such a specific value. as far from it, and that speculating on a reason for any particular value was "beyond the domain of science". Enough cosmologists saw the problem as a real one, however, for various solutions to be proposed. One solution to the problem is to invoke the anthropic principle, which states that humans should take into account the conditions necessary for them to exist when speculating about causes of the universe's properties. If two types of universe seem equally likely but only one is suitable for the evolution of intelligent life, the anthropic principle suggests that finding ourselves in that universe is no surprise: if the other universe had existed instead, there would be no observers to notice the fact. The principle can be applied to solve the flatness problem in two somewhat different ways. The first (an application of the 'strong anthropic principle') was suggested by C. B. Collins and Stephen Hawking, who in 1973 considered the existence of an infinite number of universes such that every possible combination of initial properties was held by some universe. In such a situation, they argued, only those universes with exactly the correct density for forming galaxies and stars would give rise to intelligent observers such as humans: therefore, the fact that we observe Ω to be so close to 1 would be "simply a reflection of our own existence." An alternative approach, which makes use of the 'weak anthropic principle', is to suppose that the universe is infinite in size, but with the density varying in different places (i.e. an inhomogeneous universe). Thus some regions will be over-dense (Ω > 1) and some under-dense (Ω < 1). These regions may be extremely far apart - perhaps so far that light has not had time to travel from one to another during the age of the universe (that is, they lie outside one another's cosmological horizons). Therefore, each region would behave essentially as a separate universe: if we happened to live in a large patch of almost-critical density we would have no way of knowing of the existence of far-off under- or over-dense patches since no light or other signal has reached us from them. An appeal to the anthropic principle can then be made, arguing that intelligent life would only arise in those patches with Ω very close to 1, and that therefore our living in such a patch is unsurprising. This latter argument makes use of a version of the anthropic principle which is 'weaker' in the sense that it requires no speculation on multiple universes, or on the probabilities of various different universes existing instead of the current one. It requires only a single universe which is infinite - or merely large enough that many disconnected patches can form - and that the density varies in different regions (which is certainly the case on smaller scales, giving rise to galactic clusters and voids). However, the anthropic principle has been criticised by many scientists. For example, in 1979 Bernard Carr and Martin Rees argued that the principle “is entirely post hoc: it has not yet been used to predict any feature of the Universe.” Others have taken objection to its philosophical basis, with Ernan McMullin writing in 1994 that "the weak Anthropic principle is trivial ... and the strong Anthropic principle is indefensible." Since many physicists and philosophers of science do not consider the principle to be compatible with the scientific method, another explanation for the flatness problem was needed.
) during a short period in its early history. The theory of inflation was first proposed in 1979, and published in 1981, by Alan Guth. His two main motivations for doing so were the flatness problem and the horizon problem, another fine-tuning problem of physical cosmology. must therefore decrease with time. as required above, for example. Subsequent evolution of the universe will cause the value to grow, bringing it to the currently observed value of around 0.01. Thus the sensitive dependence on the initial value of Ω has been removed: a large and therefore 'unsurprising' starting value need not become amplified and lead to a very curved universe with no opportunity to form galaxies and other structures. This success in solving the flatness problem is considered one of the major motivations for inflationary theory. Although inflationary theory is regarded as having had much success, and the evidence for it is compelling, it is not universally accepted: cosmologists recognize that there are still gaps in the theory and are open to the possibility that future observations will disprove it. In particular, in the absence of any firm evidence for what the field driving inflation should be, many different versions of the theory have been proposed. Many of these contain parameters or initial conditions which themselves require fine-tuning in much the way that the early density does without inflation. For these reasons work is still being done on alternative solutions to the flatness problem. These have included non-standard interpretations of the effect of dark energy and gravity, particle production in an oscillating universe, and use of a Bayesian statistical approach to argue that the problem is non-existent. The latter argument, suggested for example by Evrard and Coles, maintains that the idea that Ω being close to 1 is 'unlikely' is based on assumptions about the likely distribution of the parameter which are not necessarily justified. Despite this ongoing work, inflation remains by far the dominant explanation for the flatness problem. The flatness problem is naturally solved by the Einstein–Cartan–Sciama–Kibble theory of gravity, without an exotic form of matter required in inflationary theory. This theory extends general relativity by removing a constraint of the symmetry of the affine connection and regarding its antisymmetric part, the torsion tensor, as a dynamical variable. It has no free parameters. Including torsion gives the correct conservation law for the total (orbital plus intrinsic) angular momentum of matter in the presence of gravity. The minimal coupling between torsion and Dirac spinors obeying the nonlinear Dirac equation generates a spin-spin interaction which is significant in fermionic matter at extremely high densities. Such an interaction averts the unphysical big bang singularity, replacing it with a bounce at a finite minimum scale factor, before which the Universe was contracting. The rapid expansion immediately after the big bounce explains why the present Universe at largest scales appears spatially flat, homogeneous and isotropic. As the density of the Universe decreases, the effects of torsion weaken and the Universe smoothly enters the radiation-dominated era. ^ Since there are fluctuations on many scales, not a single angular separation between hot and cold spots, the necessary measure is the angular scale of the first peak in the anisotropies' power spectrum. See Cosmic Microwave Background#Primary anisotropy. ^ Liddle uses an alternative notation in which Ω0 is the current density of matter alone, excluding any contribution from dark energy; his Ω0+ΩΛ corresponds to Ω0 in this article. ^ a b Peacock, J. A. (1998). Cosmological Physics. Cambridge: Cambridge University Press. ISBN 978-0-521-42270-3. ^ Robert H. Dicke (1970). Gravitation and the Universe: Jayne Lectures for 1969. American Philosophical Society. ISBN 978-0871690784. ^ a b c Barbara Ryden (2002). Introduction to Cosmology. San Francisco: Addison Wesley. ISBN 978-0-8053-8912-8. ^ a b Peter Coles; Francesco Lucchin (1997). Cosmology. Chichester: Wiley. ISBN 978-0-471-95473-6. ^ a b Liddle, Andrew (2007). An Introduction to Modern Cosmology (2nd ed.). Chichester; Hoboken, NJ: Wiley. p. 157. ISBN 978-0-470-84835-7. ^ Stompor, Radek; et al. (2001). "Cosmological Implications of the MAXIMA-1 High-Resolution Cosmic Microwave Background Anisotropy Measurement". The Astrophysical Journal. 561 (1): L7–L10. arXiv:astro-ph/0105062. Bibcode:2001ApJ...561L...7S. doi:10.1086/324438. ^ D. N. Spergel, et al. (June 2007). "Wilkinson Microwave Anisotropy Probe (WMAP) Three Year Results: Implications for Cosmology". Astrophysical Journal Supplement Series. 170 (2): 337–408. arXiv:astro-ph/0603449. Bibcode:2007ApJS..170..377S. doi:10.1086/513700. ^ a b Agazzi, Evandro; Massimo Pauri (2000). The Reality of the Unobservable: Observability, Unobservability and Their Impact on the Issue of Scientific Realism. Springer. p. 226. Bibcode:2000ruou.book.....A. ISBN 978-0-7923-6311-8. ^ a b Collins, C. B.; Hawking, S. (1973). "Why is the Universe Isotropic?". Astrophysical Journal. 180: 317–334. Bibcode:1973ApJ...180..317C. doi:10.1086/151965. ^ Barrow, John D.; Tiple, Frank J. (1986). The Anthropic Cosmological Principle. Oxford: Clarendon Press. p. 411. ISBN 978-0-19-851949-2. ^ a b c Mosterín, Jesús (2003). "Anthropic Explanations in Cosmology". Retrieved 2008-08-01. ^ Carr, Bernard J.; Rees, Martin (April 1979). "The anthropic principle and the structure of the physical world". Nature. 278 (5705): 605–612. Bibcode:1979Natur.278..605C. doi:10.1038/278605a0. ^ Castelvecchi, Davide (1981). "The Growth of Inflation". Physical Review D. 23 (2): 347. Bibcode:1981PhRvD..23..347G. doi:10.1103/PhysRevD.23.347. ^ Guth, Alan (January 1981). "Inflationary universe: A possible solution to the horizon and flatness problems". Physical Review D. 23 (2): 347–356. Bibcode:1981PhRvD..23..347G. doi:10.1103/PhysRevD.23.347. ^ Coles, Peter; Ellis, George F. R. (1997). Is the Universe Open or Closed? The Density of Matter in the Universe. Cambridge: Cambridge University Press. ISBN 978-0-521-56689-6. ^ Albrecht, Andreas (August 2000). Proceedings of the NATO Advanced Study Institute on Structure Formation in the Universe, Cambridge 1999. Nato Asic Proc. 565: Structure Formation in the Universe. 565. p. 17. arXiv:astro-ph/0007247. Bibcode:2001sfu..conf...17A. ISBN 978-1-4020-0155-0. ^ Guth, Alan (1997). "Was Cosmic Inflation the 'Bang' of the Big Bang?". The Beamline. 27. Retrieved 2008-09-07. ^ a b Bird, Simeon; Peiris, Hiranya V.; Easther, Richard (July 2008). "Fine-tuning criteria for inflation and the search for primordial gravitational waves". Physical Review D. 78 (8): 083518. arXiv:0807.3745. Bibcode:2008PhRvD..78h3518B. doi:10.1103/PhysRevD.78.083518. ^ Chernin, Arthur D. (January 2003). "Cosmic vacuum and the 'flatness problem' in the concordant model". New Astronomy. 8 (1): 79–83. arXiv:astro-ph/0211489. Bibcode:2003NewA....8...79C. doi:10.1016/S1384-1076(02)00180-X. ^ Nikolic, Hrvoje (August 1999). "Some Remarks on a Nongeometrical Interpretation of Gravity and the Flatness Problem". General Relativity and Gravitation. 31 (8): 1211. arXiv:gr-qc/9901057. Bibcode:1999GReGr..31.1211N. doi:10.1023/A:1026760304901. ^ Anderson, P. R.; R. Schokman; M. Zaramensky (May 1997). "A Solution to the Flatness Problem via Particle Production in an Oscillating Universe". Bulletin of the American Astronomical Society. 29: 828. Bibcode:1997AAS...190.3806A. ^ Evrard, G; P. Coles (October 1995). "Getting the measure of the flatness problem". Classical and Quantum Gravity. 12 (10): L93–L97. arXiv:astro-ph/9507020. Bibcode:1995CQGra..12L..93E. doi:10.1088/0264-9381/12/10/001. .
^ Poplawski, N. J. (2010). "Cosmology with torsion: An alternative to cosmic inflation". Phys. Lett. B. 694 (3): 181–185. arXiv:1007.0587. Bibcode:2010PhLB..694..181P. doi:10.1016/j.physletb.2010.09.056. ^ Poplawski, N. (2012). "Nonsingular, big-bounce cosmology from spinor-torsion coupling". Phys. Rev. D. 85 (10): 107502. arXiv:1111.4595. Bibcode:2012PhRvD..85j7502P. doi:10.1103/PhysRevD.85.107502.